Insects Au Gratin, a collaborative project involving LSBU's Susana Soares, Andrew Forkes and Dr Ken Spears, explores the nutritive and environmental aspects of entomophagy (the consumption of insects as food), combined with 3D food printing technologies. The foods are made by drying and then grinding insects into a fine powder. The resulting 'flour' is then mixed with other food products such as icing butter, chocolate, spices, and cream cheese, to form the right consistency. Speaking to newspaper Metro about the project, Susana Soares who lectures in Product Design at LSBU, said: "As the population grows, insects will be a solution to some food problems." The Food and Agriculture Organisation of the United Nations has stressed that trends towards 2050 predict a steady population increase to 9 billion people - forcing an increased food output from available agro-ecosystems, resulting in an even greater pressure on the environment. Insects are a rich source of nutrition - four crickets provide as much calcium as a large glass of milk, while one dung beetle proportionately contains more iron than a steak. "Mealworms have proved to be quite useful - you can get a 40 to 50 per cent protein count. We have then been turning them into flour, combining that with a fondant paste and using that in a 3D printer", says collaborator Dr Ken Spears, an LSBU food scientist. 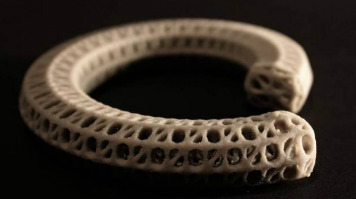 Radical uses of 3D printing technology may enable us to overcome the traditional aesthetic issues of 'eating insects' and challenge people's perceptions of eating insects. The use of insect protein as a 'printable' material opens up a range of new applications and questions about sustainability, raw materials, nutrition, and food acceptance. Speaking to The Telegraph Dr Ken Spears said "We are using this very hi-tech printing ability to try to encourage people to consider a new protein source." "We would like to do things like printing cake toppings, flowers and designs. If we can get a substantial structure we can print bars, like cereal bars." Although the notion of printing food is not a new development, the innovation of using insect paste as a build medium is highly novel. This - coupled with farming and harvesting insects - could create a sustainable source of food for an increasing global population.